1. Materials Compatibility: As with all gas handling equipment, care must be taken to ensure that the materials used to construct the flowmeter are compatible with the service gas. Each of the flowmeters shown in this catalog is provided with a list of its Materials of Construction. This information should be used with the gas compatibility data provided under "Technical Information". 2. Pressure and Temperature Ratings: The flowmeter must be capable of handling pressures and temperatures required by the particular application. Maximum operating pressures and temperatures are provided for each flowmeter under "Specifications." 3. Measuring Range: Flowmeters have specific measuring ranges associated with them. These ranges will vary depending on the flowmeter model as well as the tube and float combination selected. Obviously, the specific flowmeter chosen must be capable of measuring in the flow range required by the process. In general, for the best accuracy, it is suggested that the flowmeter be sized for operation in the upper part of its range. 4. Accuracy: The flowmeter should be accurate to the degree required by the application. Accuracy specifications are listed for each of our flowmeters. Generally, this will be ± 5% or ± 10% of full scale (although the Series 150 flowmeters also have an optional ± 1% full scale calibration available.) Full scale accuracy means that the accuracy specification is based on the flowmeter's maximum capacity. For example, a meter with a measuring range of 1-10 slpm and an accuracy specification of ± 10% will have an actual accuracy of ± 1 slpm across its entire range--that is, ± 10% of the maximum capacity of 10 slpm. 5. Repeatability: In many gas processes, the ability to duplicate flow measurements over time is more important than the absolute accuracy of the readings. The repeatability specification shown for each flowmeter refers to the degree to which a meter will repeat a previous flow reading. In general, variable area flowmeters have very good repeatability, many as high as ± 0.5% of full scale. 6. 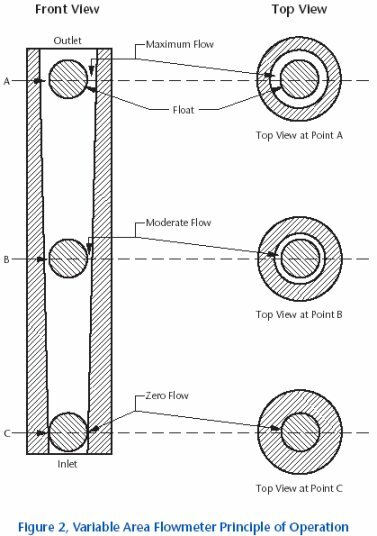 Metering Valves: Flowmeters only measure flow. If adjustments to flow rates are required, a flowmeter equipped with a metering valve should be selected.